COMMENTS: Has been excellent for my fourth of July soaps! COMMENTS: First time I used it the stained glass orange colorant stained it. Otherwise its a great mold. Very cute and easy to use once you get the hang of it. COMMENTS: This little mold worked great for embeds in my Christmas soaps. COMMENTS: Fun little mold. Worked perfectly. Because of other reviews I made sure to rubber band mine a couple times and had no problems whatsoever. COMMENTS: Perfect embeds all around! These guys are small, and perfect! I use them in a variety of ways. COMMENTS: liked this mold, put a couple in blue beach daisies cp soap,Very pretty. COMMENTS: This is actually going to be used to make a multi cold process soap I have been working on the design for. I may use it for melt and pour too. It's easy to fill and remove soap from. "Way to small! More like micro"
COMMENTS: I do not like this mold.I do like the star shape but it is so small I may not be able to pour soap batter in it. COMMENTS: A lot smaller then I expected but it is amazing for adding that little something to my soap. I make several in different colors slice them up and sprinkle them on top of soap. Add a little glitter and it is starry perfection! COMMENTS: Worked well. Make sure seams are tightly closed when using. COMMENTS: I got this along with the tiny heart! It is super cute! Easy to put together and take apart! Also very easy to fill, and clean! 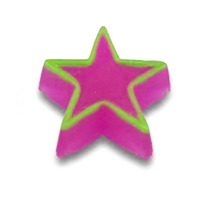 COMMENTS: Fantastic for cold process with clear M&P stars with mica's to show through the soaps.. Customers just adore the soaps of the stars!! "How many ounces does this mold hold?" Staff Answer This mold holds approximately 1/2 a fluid ounce. "What's the length and width of the finished inbed?" Staff Answer This mold is 8 1/8" in length and 1/2" wide.